We can help you with WATT ever your electrical or low voltage needs are! R.L. 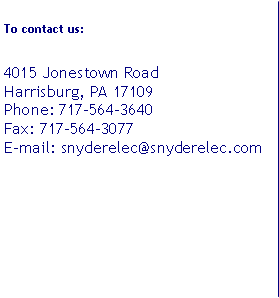 Snyder Electric, Inc. has been in business and operating in the Central Pennsylvania area since the 1930’s. We accommodate Commercial, Industrial, and Residential electrical needs. We are customer service oriented and still believe in keeping the customer number one. You are our greatest asset and we will do everything possible to make sure you receive prompt, courteous and quality service. We are fully insured, licensed and listed with the state of PA as a certified electrical contractor. All of our employees have both Federal and State background checks and clearances to work in school, government, and prison environments. This is done every year to stay current with all Federal and State requirements. Overall we feel that we can handle any of your electrical or low voltage requirements, we believe in treating our customers as we would want to be treated. We look forward to hearing from you and hopefully starting a professional and reliable service for you. We Accept Checks, Visa, MasterCard, Discover and American Express.